Isabel and Gary MacGurn with head chef of the Hampton location. From South India to New York, find out how the Chutney Co. got started and grew up. Gary & Isabel MacGurn started making their fresh chutneys in 1995, selling them first to local Hamptons gourmet markets and then in New York City to Fairway, Zabars, Balducci's and others. 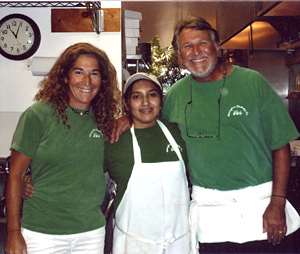 In 1997, the couple opened their first dosa shop in Amagansett. The dosas (large, crispy, sourdough crepes) were an instant success. Lines formed for lunch at this Hamptons hot spot. Customers who ordered dosas looked over the counter and watched them being made. Even with hungry people lined up at the counter, the airiness of the place and the devotional Indian chants playing in the background made for a calming atmosphere. Isabel and Gary met at an ashram in South India. They were both doing seva - selfless service - in the ashram kitchen, where devotees from all over India and around the world cooked for hundreds or thousands of people. The MacGurns loved dosas and dreamed of opening a dosa shop in the West, which they finally did in 1997. In addition to the traditional Potato Masala filling, the MacGurns offer choices such as Grilled Portabello Mushrooms, Balsamic Roasted Onions, Spinach and Goat Cheese or Avocado, Fresh Tomato, Arugula and Jack Cheese. There's even a breakfast dosa with Eggs, Spinach, Roasted Tomato, Cheese and Avocado. All of the dosas are served with a choice of fresh chutneys. 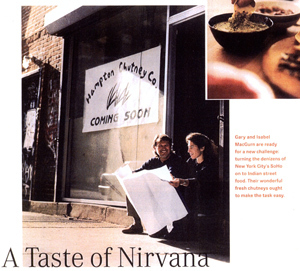 In January 2001, the MacGurns opened a Hampton Chutney Co. Café in New York City offering the same selection of dosas that is available in the original Amagansett shop. This Prince Street location, in the heart of Soho, is busy servicing not only the residents and shoppers, but also does tremendous corporate catering. The newest Hampton Chutney Co. Café opened its doors 5 years to the day after the Soho shop, in January 2006. Located on Amsterdam Avenue between 82nd and 83rd, it is a haven for neighborhood families. Kids enjoy a wide selection of healthy, kid-friendly options on the menu and can entertain themselves in the kiddie corner with books and stuffies. The restaurant offers a wide delivery range from 67th Street to 97th Street. available in both store locations. Copyright © 2012-2019 Hampton Chutney Co.